We like soy chunks at home, it's a good source of protein in a vegetarian diet, usually I add it to kurmas, briyani and I have also made parathas with it too. 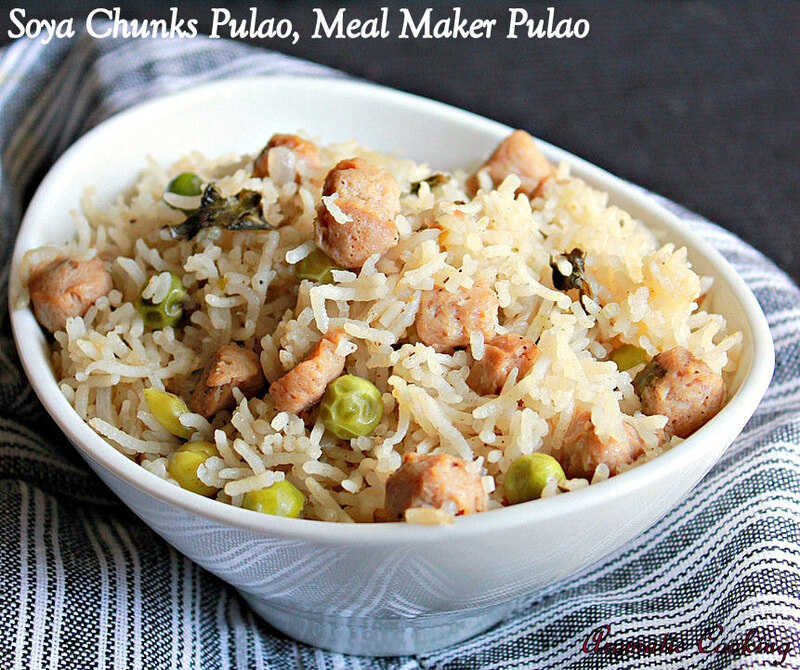 Recently I made this pulao with soy chunks, it's a simple and flavorful dish and very nutritious. Serve it along with a vegetable raitha or kurma for a complete and delicious meal..
Wash and soak the rice for about 30 minutes. Cook the soy chunks in boiling water for 3 to 4 minutes, drain, wash a couple of times in plain water, squeeze and keep. Pound together the green chillies, garlic and ginger and keep. Heat a mixture of oil and ghee ( 4 to 5 teaspoons ), add the bay leaf, cardamom, cinnamon, cloves and kalpasi, when the spices sizzle and sputter, addd the onion and saute for 2 minutes. Then add the ginger-garlic-chilly mixture and saute till the raw smell disappears. Add the soy chunks, mint leaves and garam masala and mix for another minute. Add the drained rice and peas and mix for 2 more minutes, then add 3 cups of water and salt. 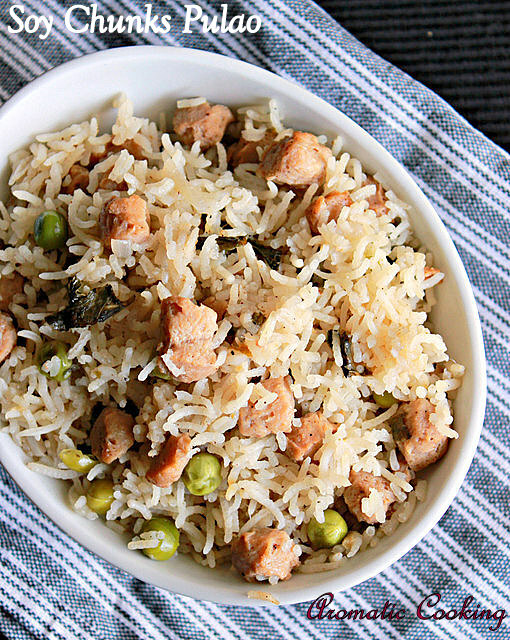 Once it starts boiling, cover and cook on medium heat till all the water is gone and the rice is cooked. Switch off the flame, cover and leave it for at least 15 minutes, then serve it with some raitha, kurma or chips on the side. After cooking, if the soy chunks are too big, then chop them and add. Kalpasi gives a nice flavor, if you can't find it, then use star anise, but the flavor of kalpasi is very good. Ghee gives a nice flavor, but if you want to avoid, then use only oil. That looks just like chicken fried rice :-)) If you didn't say they were soya chunks, I would have taken them as diced chicken. Soya chunks is my family favorite item..surely will make it...looks lovely..